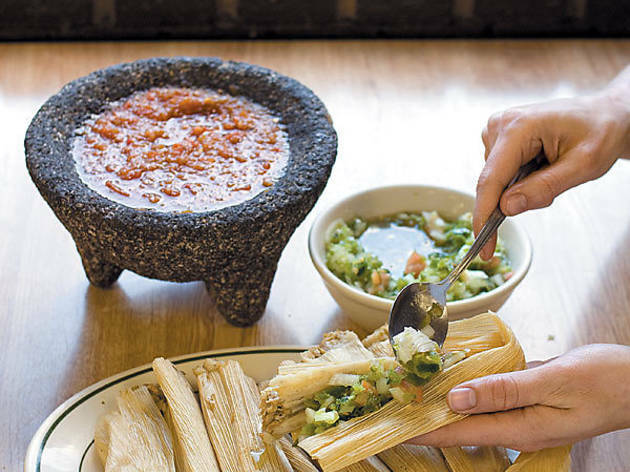 One writer goes on the hunt in Pilsen for the perfect tamale. There’s no debate about where to find the best tamales in Pilsen—they’re in a cooler helmed by the quiet, smiley woman who sells them outside the 18th Street Pink Line station. But on a recent visit to Pilsen, I walk toward the tamale woman only to find a policeman issuing her a ticket. Nice work, copper. Not only are you wasting your time, but you’re keeping me from my due snacks. And so the quest for another decent tamale in Pilsen begins. Searching for a good tamale is not like looking for a taco. You can find tacos everywhere. But many taquerías leave the tamales to the women on the street or the few restaurants that care to make them. Apparently, it’s hard to compete with places like La Cebollita (1807 S Ashland Ave, 312-492-8443), which touts itself as having the best tamales in Pilsen. Cebollita’s tamales are hefty but tender, and the pork inside has a heat that sneaks up on me just when I think I’ve gotten away without any fire. Good stuff—but I have a feeling the best tamale in Pilsen has yet to be discovered. So I keep going. A sign outside Cafe Mestizo (1646 W 18th St, 312-421-5920) hawking Oaxacan-style tamales (wrapped in banana leaves, not corn husks) inspires me to take a seat in the coffee shop and place an order. It’s the only tamale I’ve encountered in Pilsen that doesn’t cost $1—it costs $5.35—but it’s also the biggest, filled with an almost creamy chicken-and-green-sauce mixture and flanked by fruit and crema to help take the edge off the fiery chiles. I could have finished the whole thing, but I eat only half in the interest of continuing my search. I walk to Blue Island Avenue and head north until I’m standing in front of El Milagro (1927 S Blue Island Ave, 312-421-7443), the cheery café run by the masa/tortilla producer of the same name. A company that makes fresh masa should have amazing tamales, and these aren’t bad. But they can’t touch the tamales I encounter next at Restaurant La Casa Del Pueblo (1834 S Blue Island Ave, 312-421-4664). There, I ask for one chicken tamale and the woman automatically assumes I mean one dozen. Nobody eats just one of these things, maybe because they’re thinner than most, but more likely because they’re everything a great tamale should be: soft. Salty. Hints of spice from the green sauce. And most important: corny. As for the tamale woman selling her homemade specimens outside Casa Del Pueblo... I hate to bring the nice woman down, but her tamales are the perfect example of how these things can go wrong. Heavy and dense without a trace of fluffiness, the tamale gets one bite before I throw it in the trash. Maybe tamales aren’t best on the street after all. But as I make my way back to the El station, I see the police have finally left my favorite vendor alone. Within seconds, her pillowy pork tamale with green sauce is mine.